Fall Free Dining is Here!! 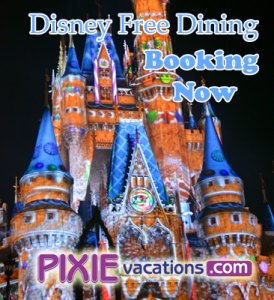 It’s official Free Dining at Disney World has been extended! You can now stay in select resorts during select dates this fall and get your food for free! As always, value resorts will get the quick service plan while deluxe and moderate resorts will get the plus dining plan! Here is the info you need to know! -Resorts that are NOT included are Art of Animation, All Star Movies, Port Orleans French Quarter, Villas at Grand Floridian, 3 bedroom villas, and Fort Wilderness Campsites. There is also a room only discount that will take a percentage of the cost of your room! These offers also qualify for a free gift card! Email me for details on booking either of these great offers! This entry was posted in Discounts, Uncategorized and tagged Free dining fall. Bookmark the permalink. ← My Favorite Epcot Snacks!! !